Please see below links to inspire thoughts about the operation of our makerspace which will be located in the McAuley Room in McAuley Library. We will also have the adjacent Discussion Room – where we are planning to locate the 3D printer. Once the wall is knocked out, we can start organizing the space – planning has commenced in relation to this – the links below indicate experiences from other schools. We want this to be a bookable space, so resources can be used both in and out of class time. However, the space will be lockable, so equipment and projects are protected when the space is not supervised. So, we are currently at the planning stage in terms of the room. However, we have been running a “pop-up” makerspace program since Term 4 last year in the libraries. We are also in the planning stage for a focus on electronic type workshops for Term 3 (circuits, coding, makey makey etc.) We currently have IT looking at providing access to software needed to run these programs such as Arduino and Lego Wedo (we currently have borrowed kits from BCE Library and have purchased makey makeys ) and also investigating how to offer augmented reality experiences. The Library workshop program is offered in the first 4 weeks of term, to work in with the assessment program. 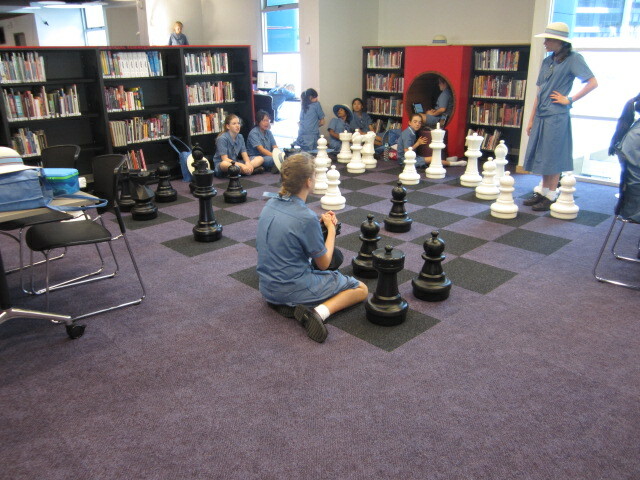 However, students can borrow the games etc. at other times. We are establishing connections with curriculum and other areas e.g. Yr 8 ICT TEAM/STEAM potential program for 2016 (meeting today), Yr 8 ICT Genius Workshops – started Term 1 and extending these Term 2, connecting with Science and counsellors, discussions with drama staff regarding theatrical makeup sessions for Drama. We will survey staff and students about what skills people have already that can be shared, and what areas they would prefer to learn, to guide what we offer. We are also expecting that students will be able to increasingly train other students and take leadership in creating and inventing. We will also use surveys to obtain feedback on the current program. We are still offering information literacy (currently trialing integration of Research Made Easy model with Social Science and TDU classes using onenote) and reading promotion lessons. However, we are utilizing methods such as screencasting and our ahs youtube site, to provide these additional makerspace activities by utilizing library staff in different ways. We aim to make these activities increasingly student led/centred, so will encourage older students who have learnt activities to teach other students. We will obtain survey/feedback information from students to inform activities offered. We hope to add in 3D printing when we have the technology for this – will look further at various 3D printers next term. Planning for turning the McAuley Room into a Makerspace is underway. Seek connections with Science or other subjects or overlaps or opportunities we have not thought of..